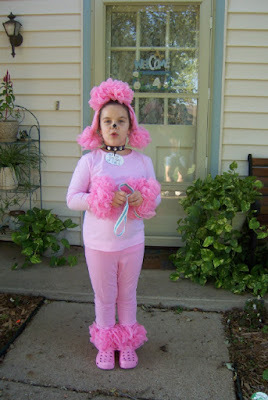 "Fifi, The Pink French Poodle"
My daughter wore this costume last year and everyone raved about it. Not many people make homemade costumes anymore around here. I enjoyed doing it, because she was the only "Pink Poodle" at the school and church fall festival! 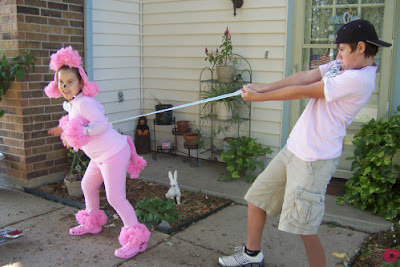 She was adorable, one picture is brother trying to control a runaway poodle! This poodle comes together quickly with bath puffs, rubber bands and two pairs. pink socks. A painted black nose and a jeweled collar pull the look together for a perfect finished touch. Cut each puff's center cord, then stretch out the puff and cut it into thirds. Wrap a rubber band around the center of each. You'll need 23 pieces.Fold each piece of bubble wrap in half and insert into a sock. Tie the socks together (I used calf length socks); if you use knee socks, trim them as needed. Slide three puff pieces on the knotted socks, positioning them around the knot, then ease the headband through their rubber bands. Slide a puff piece onto the toe of each sock. Take extra bubble wrap and stuff in one sock. Tie a knot at the top of the sock. Slide a puff piece or two at the end of the sock (toe area). Secure to child's pant with safety pin. I pinned at back of waist inside and the shirt covered it. Use rubber bands to loop four puff pieces onto each hair elastic. Twist the bands to tighten them. (I used a slip loop to put them on and didn't need to tighten them.) Your child will wear an elastic on each arm and leg. Glue the jewels in a row on the central portion of the ribbon (leave the ends unadorned so you can tie the collar at the back of your child's neck.) Draw a dog tag on the paper, punch a hole in it, and loop it on to the collar with a rubber band. I used some laminate squares to protect the paper before I punched it.